As Halloween creeps closer, you’re probably thinking of what you can do to give yourselves a good fright. Sure, you can pick out an old-fashioned horror film or game, but if you want to take it to another dimension, virtual reality is the way forward. While a home set-up can have its thrills and chills – such as the on-rails ghost ride of Until Dawn: Rush of Blood on Playstation VR – there are limits to just how immersed you can get before an annoying cable or long loading screen breaks the illusion. This is where Hyper-Reality comes in. Billed as the UK’s first VR haunted house, the pop-up venture opens this week in Shoreditch, London and uses the latest cutting edge technology to offer a number of creepy curated experiences. There are four in total split into two categories: two free-roaming haunted houses and two more of the arcade survival shoot-em-up variety. Visitors can even book one of each for the same evening for £20 (for a 40 minute slot). That’s a pretty good deal for experiencing room-scale VR when high-end blockbuster fare like The Void’s Star Wars experience can cost over £30 a pop. Hyper-Reality’s founder, Yu-Jen Chen, believes this fills a specific gap in the current VR market. “There’s the upper expensive end – big brands like Star Wars, Ghostbusters – that isn’t something a small team can do,” he explains. For its opening, Hyper-Reality aims not only to offer a curated Halloween-themed experience, but also with the kind of content that you can’t just buy from Steam – the kind that sees you actively walking through a physical space, and not just a virtual one. Chen’s VR inspiration comes at least partially from his native home of Taiwan, where HTC opened its VR theme park Viveland in 2016. Like all of Viveland’s most popular attractions, each Hyper-Reality game also supports multiple players. Hyper-Reality will be using Vive headsets, but it won’t just be a case of setting up Lighthouse sensors in a rented space. For starters, visitors won’t be tethered to a computer in the conventional sense. For the shooting games, the cables are tethered to the ceiling so that you can freely move around and blast away the undead without fear of tripping up. Meanwhile, to enable free-roaming for the haunted houses, you’ll simply be wearing the tech in the form of light and sophisticated PC backpacks. There’s a distinctly Asian flavour to the selection, owing to Chen entering the VR industry through Taiwan’s AR/VR association TAVAR, who put him in touch with the local developers. And by far the most unusual game available for Hyper-Reality has you and another player fending off against waves of ‘jiangshi’, a zombie-vampire hybrid from Chinese folklore dressed in Qing dynasty garments – and one that became a cult phenomenon in the 1980s thanks to Hong Kong horror hit Mr. Vampire. Instead of guns, you need to cast spells on strips of yellow paper before flinging them back at the jiangshi as they menacingly hop towards you. It’s certainly different from usual zombie-shooting fare we come to expect from horror games, and should take people a bit further out of their comfort zone. Each game comes with a scare rating, but hopes are that nothing is too intense to cause someone to want to rip off their headset midway. As a lapsed gamer himself, it’s the possibilities of VR that has pulled Chen back in to the industry. As such, he also wants Hyper-Reality to attract a wider audience beyond the usual gaming crowd. He’s therefore not really comparing his concept with other existing VR arcades but more with the unique activities that pop up in London all the time. “There’s things like Secret Cinema, the Ghost Bus Tours, events that people are willing to try as a date night. That’s the way I’m pitching this – something you can do with your friend or date, and do as a set of experiences,” Chen says. 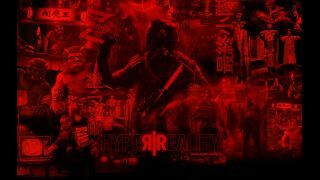 Hyper-Reality opens in Shoreditch from October 19th until November 29th. More information and advanced booking can be found on their website.